On July 20, 1969, Neil Armstrong climbed down from the ladder of the lunar module the Eagle and became the first man ever to walk on the moon. It took Armstrong a long time to become an astronaut. Even as a young kid growing up in small towns in Ohio, Armstrong had a willingness to try new things as well as a strong work ethic. Both came in handy when he applied to NASA. Though his passion for space travel came later, as a child Armstrong was fascinated with airplanes. At six years old, he took his first plane flight with his father in a passenger plane named the Tin Goose. Neil and his father, Stephen Armstrong, planned to just watch the planes at the Warren Ohio airport on a Sunday morning, but the pilot of the Tin Goose offered them a ride. The Tin Goose’s body was made of aluminum and carried up to twelve passengers in wicker chairs. Neil’s father remembered that “he was scared to death and Neil enjoyed it.” After his first passenger flight, Neil spent a lot of time building model airplanes. When he completed them, he hung them with string from the ceiling of his bedroom. As he grew, Armstrong wanted to fly planes himself, but lessons cost money. Mostly, he wanted to fly so he could understand how planes were built. Armstrong said, “While I was still in elementary school my intention was to be—or hope—was to be an aircraft designer. I later went into piloting because I thought a good designer ought to know the operational aspects of an airplane.” When he didn’t have to be at school, Armstrong worked at a pharmacy stocking shelves and sweeping floors to pay for flying lessons. Even though Armstrong had to work twenty-three hours just for one flying lesson, he still received his pilot’s license at age sixteen. He hadn’t learned to drive a car, but he could fly a small plane. After high school, Armstrong planned to go to college to study aeronautic engineering—the science of how planes were built and what made them to fly. He received a scholarship from the U.S. Navy, which allowed him to attend college in exchange for serving three years in the navy. The idea of serving in the navy didn’t bother him because he knew he would be able to fly some of the newest and fastest jets. Armstrong started taking classes at Purdue University, but soon had to learn how to pilot fighter jets when the U.S. entered the Korean War. Though flying combat missions was dangerous, Armstrong came back safely. He finished his courses at Purdue, and found work at Edwards Air Force Base. At the base, Armstrong test piloted new planes. One of the planes, named the X-15, could go almost 4,000 miles an hour at an altitude of 207,500 feet. The plane served as an early test for space flight. 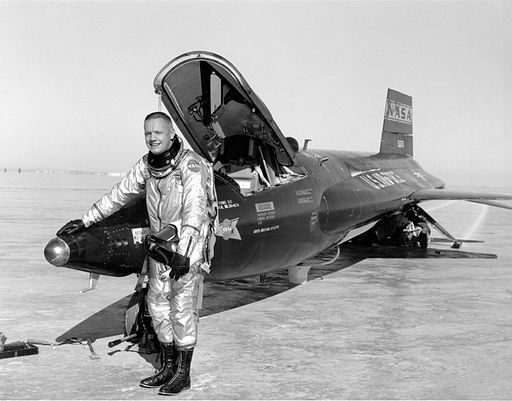 In 1962, Armstrong left the test pilot program. He decided to apply to NASA’s astronaut program, which might one day give him an opportunity to fly in outer space. He was accepted and completed one other space flight before joining the other astronauts on the space shuttle Apollo 11. Part of the shuttle, the lunar module, which the astronauts named the Eagle, landed on the moon.